Yep, I am NOT feeling very well. FMS has been kicking my rump the past couple of days. I have been having one heck of a flare up! I haven’t managed to do much more to the shirt I am making for Colin BUT I did get another Bag of Hope and Love done! A friend stopped by the other day and begged for another bag. LOL She already took one to fill and wanted to do another. 🙂 YAY! I promised I would have one for her tomorrow. OH!! Speaking of…. I dropped off 10 bags yesterday! YAY!!!! The ladies at the Dept. of Social Services were THRILLED!! WOOO HOOO!!! I hope to have at least 10 more in a couple of weeks. 😉 And the lady I spoke with said that we could put Bibles in them! YIPPPEEE!!! My oldest son, J1, went with me to help carry the Bags of Hope and Love and a small box of school supplies. On the way back we came upon an accident that had just happened. We jumped out the van and ran to see if we could help. It was awful. There was a young lady trapped in her vehicle. It looked as if it had flipped several times before landing on the driver’s side. The young lady was unconscious at first. When she came to she started crying for her mother. It was awful. It seemed to take the ambulance FOREVER to get there. She spoke very little English so it was very difficult to get her to remain calm and still until they got there. I managed to pray by the side of the road for her and then several times throughout the day. I can’t help but wonder how she is and it has been weighing heavily on my heart. Remember her in your prayers, please. My friend is still in the hospital with a broken back. Apparently they have found a lump on or near the adrenal gland. She has been keeping her spirits up but it has been tough since that found that. She has to have another MRI to check that out. Keep her in your prayers, too, please. OOOH! 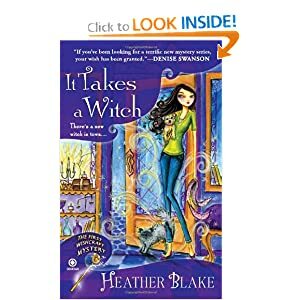 I just found out that Heather Blake is also Heather Webber!!! I ❤ her Lucy Valentine series! I am still no closer to being prepared for the start of school next week! YILES!!! I think what we will do is start off slowly… LOL The first week we will just do the basics, math, language, reading, Bible and possibly some science. I have NEVER been this ill prepared for the school year! Shame on me!!! For Cailey in science we will be starting off the year with the Young Scientists Club measurements kit. I have a couple of free units Pinned to help supplement. Deanna has decided to not do lapbooks this year. She said she would rather do unit studies and notebooking. I need to check and see what I have and what I might need. I think the biggest thing I need to do is get started on the printing… LOTS and LOTS of printing. Oh, and I reallllllly need to move all my files to flash drives! I have 2 I just need to get busy copying the files. I have way tooooooo many files and it would be a disaster if I lost them. Most of them were free at one point or another but aren’t free anymore. Then there are the ones that I bought from Currclick and Hands of a Child. ((HUGS))!! Sorry you’re feeling lousy! Congrats on the weight lost!! Good going! I’m reading the same book now and enjoying too! My only problem is that there are sooo many people being introduced that it took me a while to get them all straight. Stacy, so sorry your feeing bad..Sending prayers , you will feel better soon. Will add your friend and also the girl in the wreck to my prayer list.. Your doing great on your weight loss.It is so hard, isn’t it? Congradulations !!! Thank you SO much, Judy!!!!!! Thank you!!! Already feeling a bit better..
Good, glad to hear it! Now you can get back to your great projects. Have a wonderful week.